In 1773, Jesse Ramsden of England invented the circular dividing engine, an instrument which had a profound impact on Western history. Prior to his invention, the division and inscription of scales on mathematical instruments was done by hand. Therefore, the value of the instrument depended on the accuracy of the maker and his tools. Instruments such as surveying compasses were subject to wide variations in quality, as each instrument required a maker with an extraordinary control of tools and a very precise eye. Instruments were produced one at a time, which limited the number available for purchase and making them prohibitively expensive. Ramsden's invention of the mechanical dividing engine, however, eliminated human error and increased the production of precise scientific and mathematical instruments. This was particularly important for the development of the octant and the sextant, both vital to the British Navy. These instruments made the exploration of the world's oceans and the establishment of the British Empire possible. An octant or sextant enabled a sea captain to determine longitude, which, when mapped against latitude, provided his precise location anywhere on Earth. Ramsden shared in the national prize given to solve the longitude measurement problem. In 1856, at the age of 14, Christian Louis Berger began a decade of apprentice work with some of the finest manufacturers of precision mathematical and astronomical instruments in Europe. In 1866, he emigrated to the United States and spent an additional five years working for American instrument makers. Finally, on October 18, 1871, he and George L. Buff established the firm of Buff and Berger, specializing in surveying, engineering, mining, and scientific instruments. The company was very successful until 1898, when the two founders dissolved the firm after a dispute over how to apportion the business among their sons. Equipped with a set of excellent dividing engines, this period was arguably Berger Instrument's most productive and influential, and led to its association with academia and the publication of its unique and comprehensive catalogues." (Whitelaw, p. 4) The company continued after the death of C. L. Berger in 1922 until it was sold in 1948. Miraculously, Berger's dividing engines remained untouched and forgotten for the next 47 years. In 1995, however, Chicago Steel Tape Company, owned by Mr. Dennis Nardoni, acquired the old Berger factory and discovered these historic machines. Mr. Nardoni generously donated a Heyde Circular Dividing Engine to the Museum of Surveying in Lansing, Michigan, where it is now on display. Known as Berger's Engine No. 5, it was built by Gustav Heyde of Dresden, Germany and purchased by Berger about 1907. 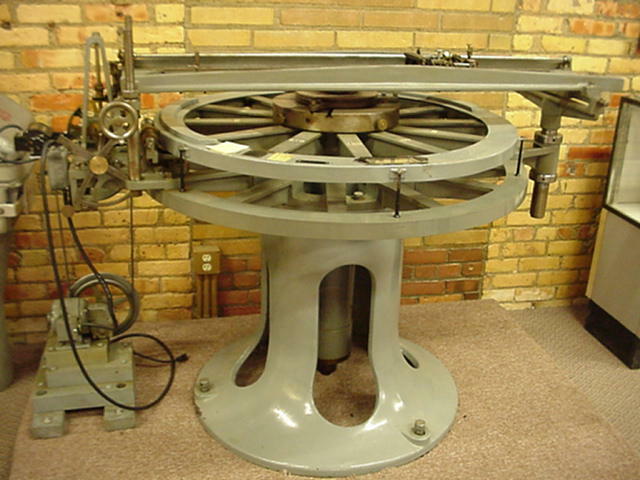 This machine is still operable and was the primary circular dividing engine in use at Berger. (Garcelon, p. 5) Mr. Nardoni also donated a Societe Genevoise D'Instruments de Physique Longitudinal Graduating Engine to the Museum, also on exhibition.